Charles Clover, Daniel Pauly, Dirk Zeller, and Sacha Bonsor. Photo by Boat International. 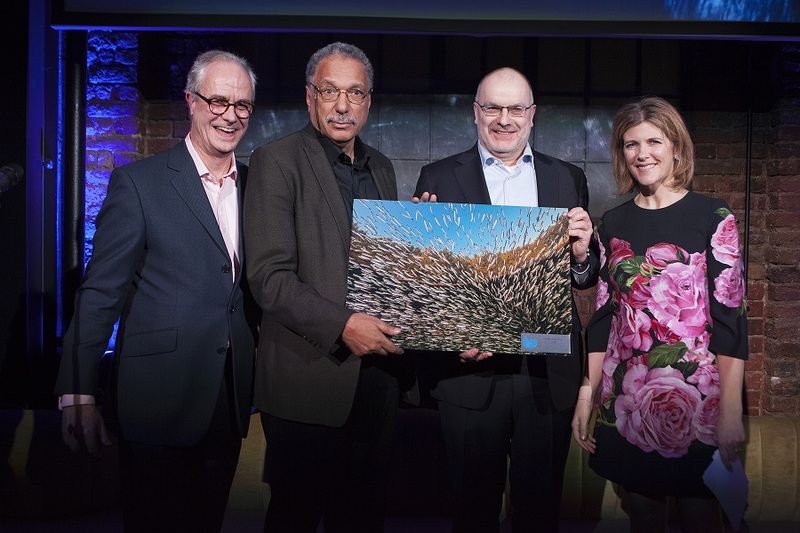 During a ceremony held at London’s “hottest place,” Restaurant Ours, the Sea Around Us leading team, Dr. Daniel Pauly and Dr. Dirk Zeller, received the Ocean Award in the Science category for their contributions to marine conservation and ocean health through the publication of the Nature Communications paper “Catch reconstructions reveal that global marine fisheries catches are higher than reported and declining” and the Global Atlas of Marine Fisheries. In these two publications, the scientists based at the University of British Columbia’s Institute for the Oceans and Fisheries reveal, among many other things, that global marine fisheries catches have been declining, on average, by 1.2 million metric tons every year since 1996 due to overfishing. 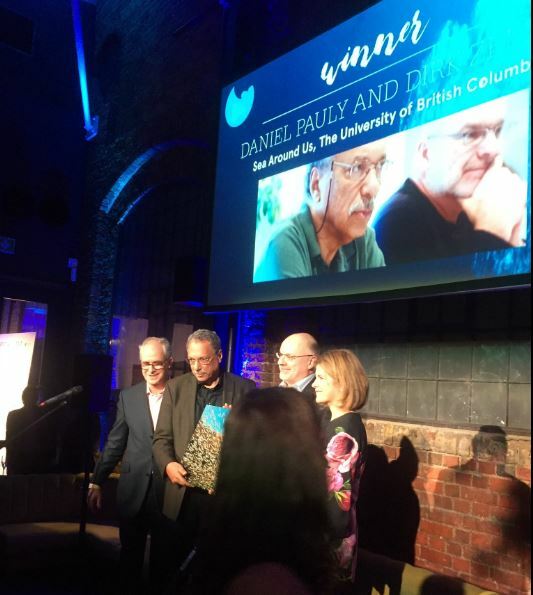 Daniel Pauly and Dirk Zeller receive the Ocean Award in the Science category. Photo by Chris Gorell Barnes. The Ocean Awards are organized by the Blue Marine Foundation and Boat International. The panel that decided on the Sea Around Us’ victory was comprised of renowned scientists, environmentalists and philanthropists such as Charles Clover, Executive Chairman of the ocean conservation charity Blue Marine Foundation and former environment editor for The Daily Telegraph; Princess Zahra Aga Khan, leader of the Aga Khan Development Network; Dr. Alex David Rogers, Professor of Conservation Biology at the Department of Zoology at the University of Oxford, among others. UBC President Santa Ono’s Tweet. Visionary to the late UN Ambassador for Oceans, Stuart Beck. Local Hero to Dennis Bryan Bait-it of Project Sharklink for his work protecting thresher sharks in Philippines. Policy to Claire Nouvian for her fight to ban deep-sea bottom trawls below 800m. Innovation to Maria Damanaki of The Nature Conservancy for the Seychelles Debt Swap programs. Responsible Business to Alex Olsen for The Industry Group Agreement to Cod Fishery in the North-East Atlantic. Public Education to journalist Ian Urbina for his New York Times series The Outlaw Ocean; and Seafarers.